the crocus & the robin. I'm a little bit addicted. My husband left the sims computer home with me yesterday... and so it sat there, taunting me. I finished up the freckles and just needed a couple more models from him so that I could take my previews and post. 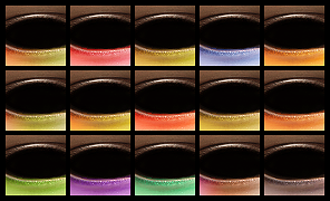 And then I remembered that I wanted to make some subtler recolors of the eyeshadows I had posted a while back. And I had already edited the alpha, I just needed to play around with the colors. 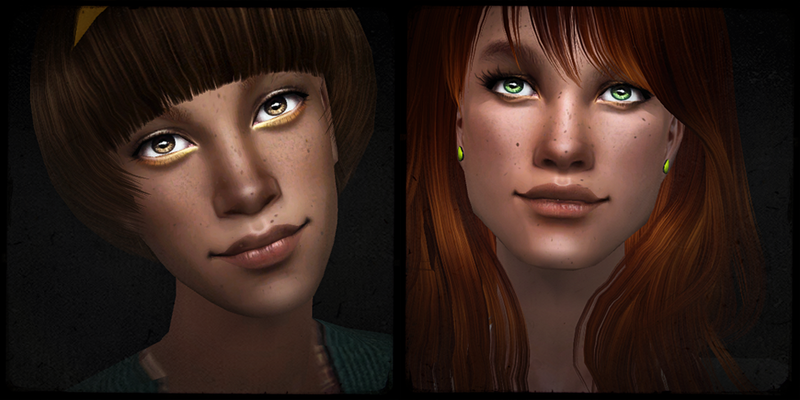 So I did that, thinking I could just stick those shadows on my freckle models and post it all together. And then I remembered these shadows, that I really like but wanted to play with. So then I did that, too, thinking I could just add them to this post as well. And now I have a giant post with three different downloads. Sorry about that. Oh! Some of these ladies are my husband's sims... but instead of taking you to his page to download them, I'm just adding their mediafire links. He hasn't uploaded them to his own LJ yet. 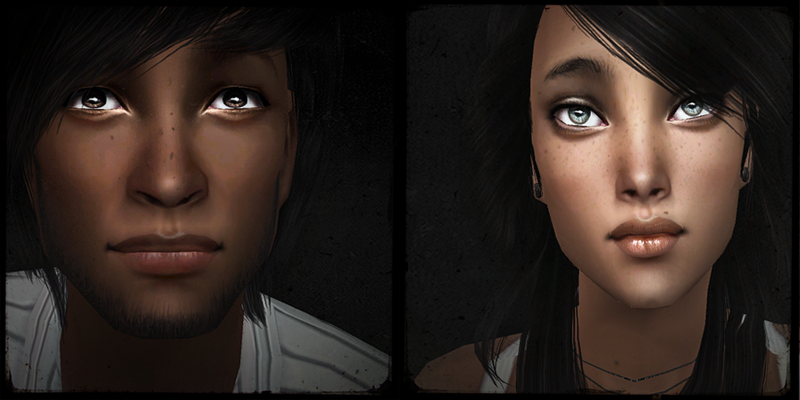 Except in the first preview diptych, his sim is the one on the right side. In this first one, she's on the left. Oops. You can see them huge and unedited here. Yay! I'm a freckle fanatic, too. I made these ones a little darker, so they work with darker skintones. SO MORE SIMS GET FRECKLES!!! Yay! I'm exhausted as hell and slightly hungover but I'm bouncing off the walls for this! Freckles! The eyeshadow's are pretty also. I just love everything you do. Hungover wall-bouncing sounds dangerous. Don't hurt yourself! OMG YAY! Thank you for sharing the awesomeness. I love you :D These are absolutely freaking fantastic! Your are feeding my addiction every time you post something. I haven't actually played my game since December, but, ARGH, I need all this. *grabby hands* Thanks so much! Yeah... I never have time to actually play anymore, either. Sad face! I'm glad I could help! I have two other freckle posts, totally 20 different freckle facemasks. And I know Pooklet's freckles are pretty awesome, too. this was an amazing thing to wake up to. especially MORE freckles. Awwww, thanks. :) I'm glad you like them. Thank you so much <3 Susannah is also gorgeous. Thank you! I will pass that on to my husband - he's the one who made her. Thank you, they look really great! Can't wait to test them! Yay! 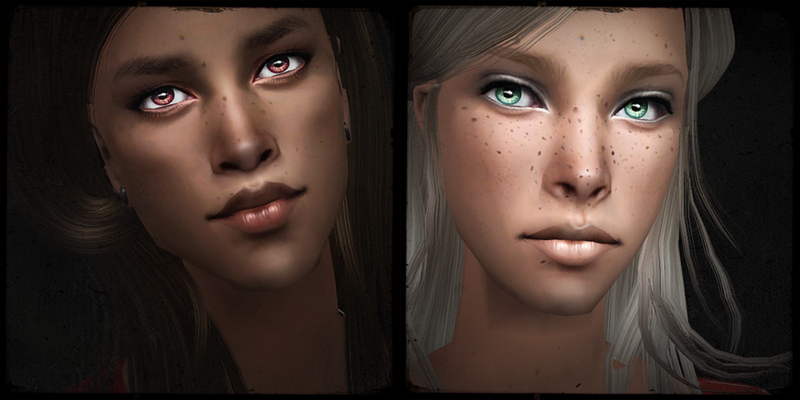 I grabbed all three because I already abuse the hell out of your other eye shadows and freckles in my game. :D Thank you! I'm so picky about my eyeshadows, but these are perfect! wow, these all look beautiful. yay more freckles, you can never have too many! Thank you! And I totally feel the same way about freckles. You have the most awesome addictions. It's kind of silly how many things I have downloaded and installed when I haven't even lloaded up my game, but I can't resist. Luckily, playing long enough to take my preview pictures sort of scratches the itch. Sort of.